This grilled steak menu is a barbecue feast that’s perfect for celebrating with family and friends. In small saucepan, cook wine, shallot, vinegar and peppercorns over medium-high heat for 3 to 5 minutes or until reduced to 1 tbsp (15 mL). Strain and set aside. In small saucepan, heat Stirling Creamery Garlic Parsley Butter Roll over medium-high heat until melted and bubbling. Meanwhile, in blender, combine vinegar mixture with egg yolks, lemon juice and mustard; purée until smooth. With motor running, pour bubbling butter into blender. Season with salt and pepper. Keep warm. Preheat grill to medium-high heat; grease grate well. Pat steaks dry with paper towel; season with salt and pepper. Grill steaks for 4 to 5 minutes per side for medium-rare or cook until done as desired. Let stand for 10 minutes before serving. Top with ¼” medallions of Stirling Creamery Garlic Parsley Butter Roll. 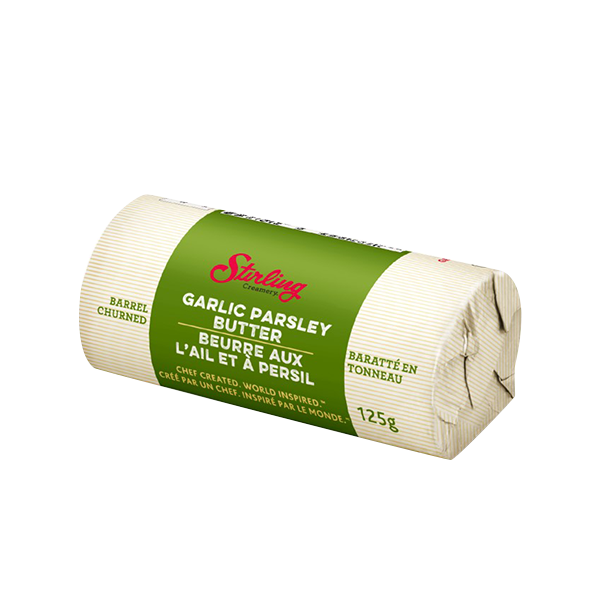 Meanwhile, heat half of the Stirling Creamery Garlic Parsley Butter Roll in large skillet set over medium-high heat; cook noodles for 3 to 5 minutes or until tender-crisp. Remove from heat; stir in 2 tbsp (30 mL) water and remaining butter, swirling pan until butter is melted. Divide noodles among 4 plates. Serve with Grilled Steak and Béarnaise Sauce. For family-style presentation, slice steak and serve on a large board or platter with Béarnaise Sauce and veggie noodles.